One of my best friends recently began making the transition from stage acting to primarily voice acting. The challenge: how do you make a website that conveys personality without using any headshots of the actor, since voiceover actors don't want their clients to be swayed by their appearances? Talon's whole advertising campaign was built around his persona as a modern-day Sinatra. 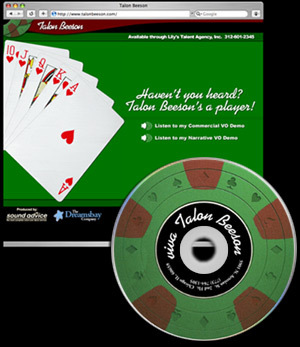 The media kit we designed, which also contained a postcard and a CD, focused on the whole Las Vegas player mentality. By using only object photography and smooth shapes and colors, we were able to evoke exactly the mood Talon was going for, without ever showing his face. Talonbeeson.com was built using Photoshop and hand-coded HTML. The postcard and CD design were crafted using Photoshop and Illustrator.